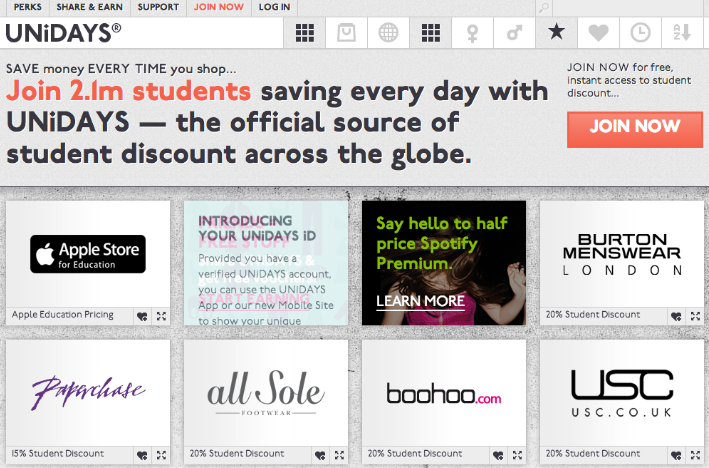 UNiDAYS is a nice and easy to use website for students in the UK providing great online discounts and offers (mostly from 10 to 20% off) from big retailers from the likes of ASOS, Surfstitch, Urban Outfitters and Topshop. You will have to verify your student status with UNiDAYS to start using the website, so have your student card at the ready! However, just have a little patience while browsing, as some features of the site can get a little annoying. Save your favourites so that you don’t forget them! Search filter only turns up pop up results, rather than an accessible list. ‘Redeem Now’ button forces several pop ups rather than simply taking you to a new tab or loading screen. Share and earn scheme allows you to earn £0.50 for each friend that signs up – letting you earn up to £30.00 a month! UNiDAYS was created specifically for students. Not only does it provide competitive student prices for when your student loan has finally all gone, but all the discounts on offer are relevant and reliable, meaning you can save money on the things you love the most. Go back to our Student Shopping category to find a host of other sites offering discounts and offers for students in the UK.